12 shallow tray mobile unit with coloured edge - 2 columns of 6). Tray storage available in Beech or Japanese Ash MFC. Delivered assembled, complete with castors and trays. 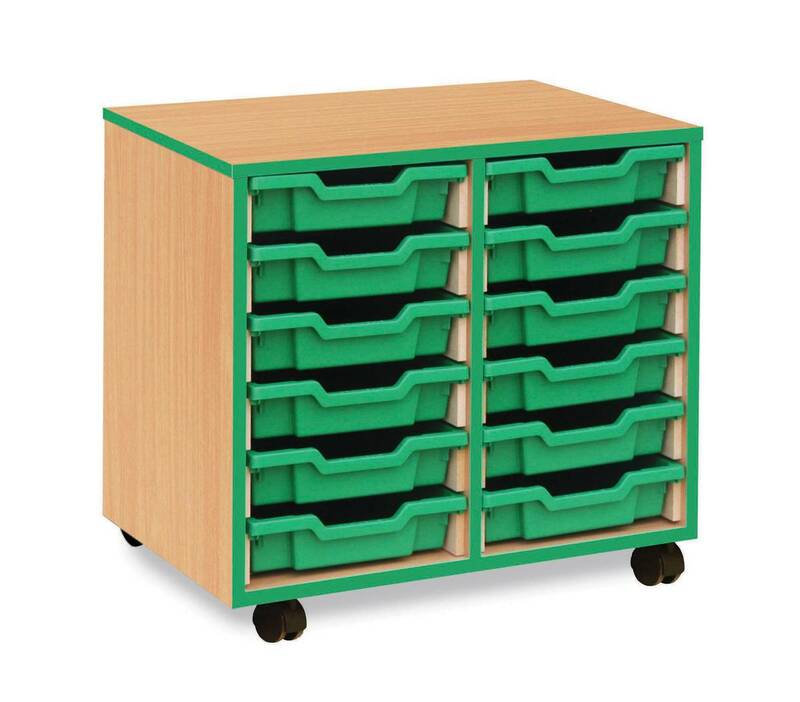 Gratnells trays are available in a range of colours and 4 sizes (see below). All Monarch furniture units come with a 5 year manufacturer's warranty. Goods are built to order, and cannot be cancelled once the order is placed with the supplier. Redelivery—if you are not in when delivery is attempted, there is a redelivery fee. If goods no longer wanted, there is also a restocking fee. See terms and conditions for full details. * Some delivery exclusions apply. Please click here for full details. Wishtrac will use the information you provide on this form to send you emails including special offers and free downloadable resources, usually no more than twice a month. You can change your mind at any time by clicking the unsubscribe link in the footer of any email you receive from us, or by contacting us at marketing@wishtrac.com. We will treat your information with respect. For more information about our privacy practices please visit our website. By clicking above, you agree that we may process your information in accordance with these terms.